I hope you are all sitting down, as I am going to be talking about a co-operative game *gasp* OK, well it’s a semi co-op so don’t know if it really counts! Based on the Jules Verne novel of the same name, players are racing to get a message to the Czar's brother. However, you are also racing against an assassin who is also trying to get to him, whilst dealing with the Tartar forces who are trying to reach Moscow. Players must work together to eliminate the threats whilst also trying to be the first to deliver the message. See, you knew there had to be a catch and I wasn’t really playing co-op games, right? Place the board in the middle of the table, separate and shuffle the different types of cards. Place the action cards in the envelope area and the revolution discs next to them. Take the first Ally card and place it in space A of the ally area, place the rest of the cards nearby. Place Sangarra next to the board, near the allies. Place the five ‘area’ (Siberia, Tomsk, Ural Mountains, Russia and Irkutsk) in the appropriate places on the board. Place the black Tartar die on space 9 of the board with a value of three showing. Place the black meeple in the box that corresponds to the player count. Give each player a player board and the matching colour meeple and disc. 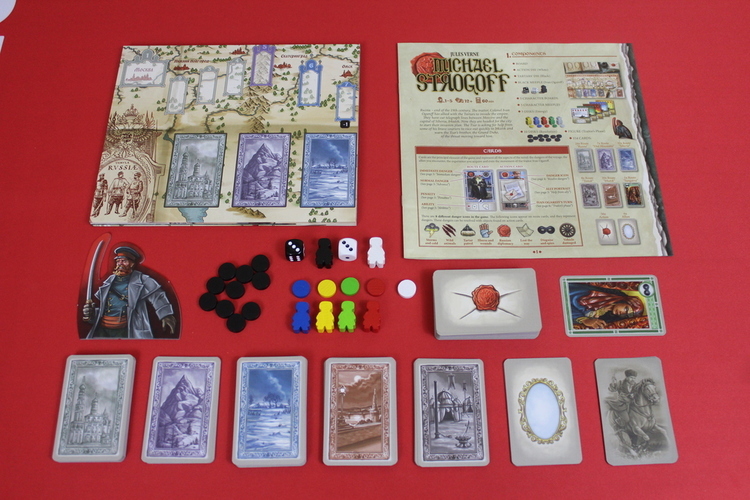 Place the energy disc on space six of the player board and the meeple on Moscow - the first space of the journey. 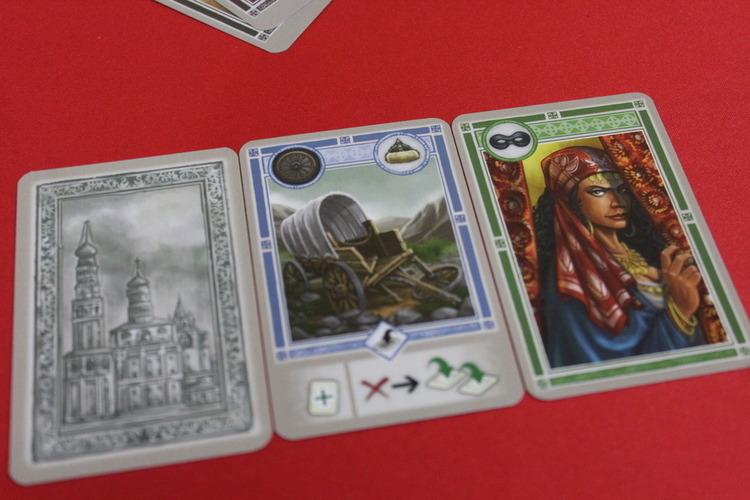 Deal five cards to each player that will be their starting hand and draw a Russia card and place it to the right of the character boards to show the start of their journey. The start player is the last person that wrote and sent a letter and play will proceed clockwise around the table. Place the traitor figure between the last and first player to remind you to play the traitor phase. The cards really are the main mechanic of this game and can be used in a variety of ways. 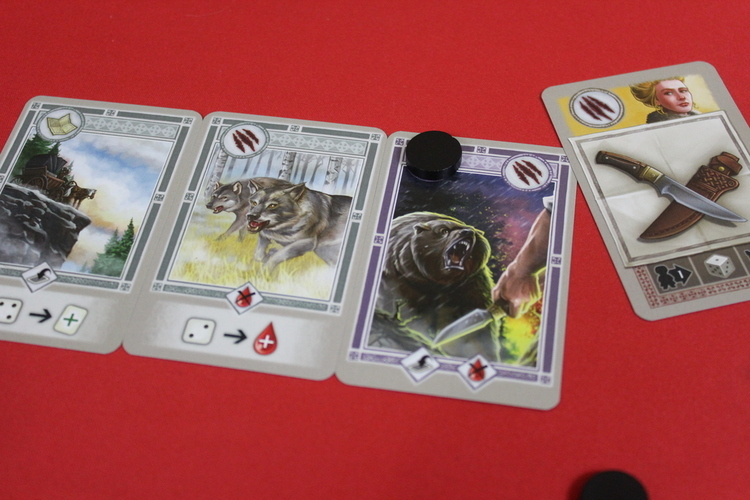 The action cards have three elements. 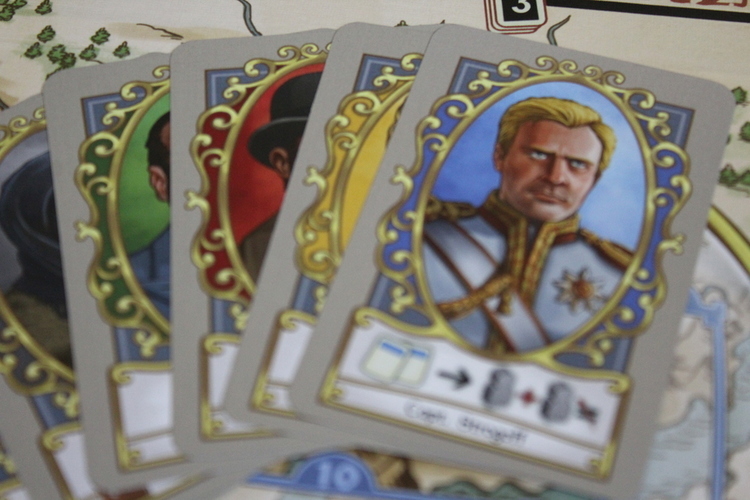 The Danger Icon in the top left, the Ally Portrait and the traitors phase at the bottom of the card. The route cards have three or four elements. They may or may not have an Immediate Danger Icon on the top left (this is represented with a dark background behind the symbol), a Danger Icon in the top right, an ability along the bottom of the card and just above that a penalty icon. 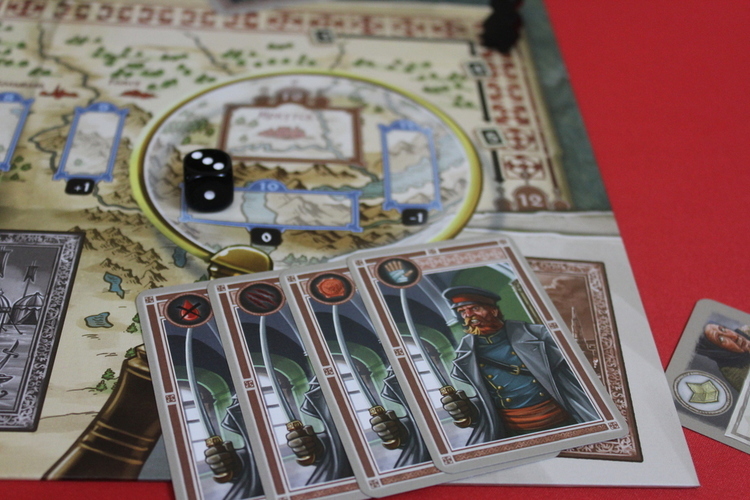 Each turn is fairly quick as players can only take one action. However, before taking actions they may decide to enlist the help of an ally. Over the course of the game characters will come and go and each of these has a special ability that will aid players in their journey. 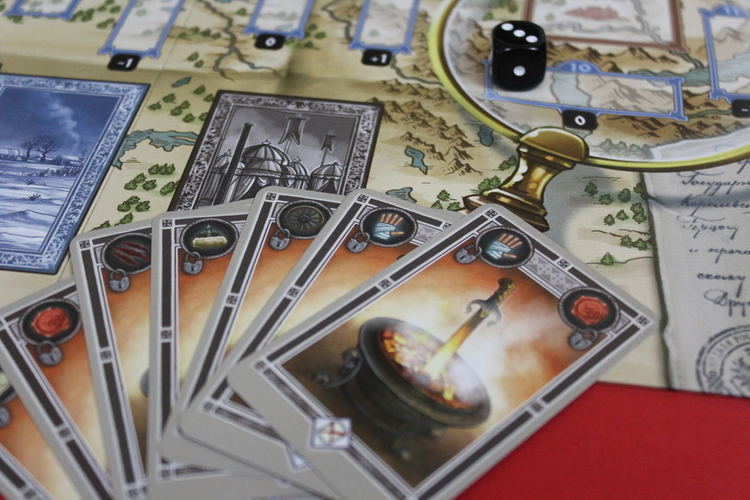 At the start of a turn, a player may discard a card to activate the ability of an ally currently out on the board. You must discard a card that has the matching portrait. A player may only enlist the help of any ally once per turn. During the game, players take route cards that represent the dangers facing them on their journey. 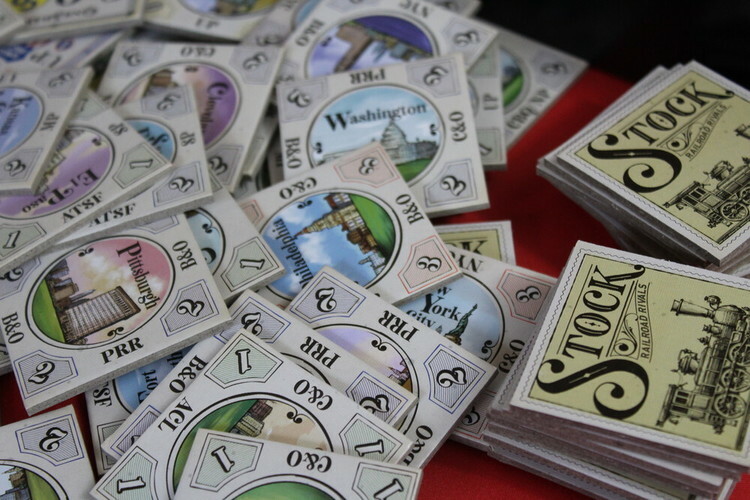 These cards form a line along the right-hand side of their player board. However, if a danger icon on the cards is repeated they are in trouble! The route cards for Russia only have one danger icon, however, as their journey continues it gets more treacherous and the cards will have two icons - one immediate danger and one normal danger. To advance, a player reduces their energy by one point and advances their meeple to the next square on the journey. They must then draw a card from the area they have advanced into and place it on the right of their board, next to any previously placed route cards. If the card has an immediate danger icon the player may immediately discard an action card with the same symbol. If you can, place a resolution disc on top of it, that danger is immediately resolved. Next, check the line of cards for matching danger icons. If there are any repeated icons, the player must activate penalty icons for all cards in their journey (not just the ones with the matching icons!) There are three types of penalties: lose one energy point, chose a card from your hand and discard it or flip this card face down. Whenever a player is unable to fulfill a penalty (not having enough energy or cards in hand) they must flip the card face down instead. If a card has a resolution disc on it and has to be flipped, the disc is lost and the danger will have to be resolved again once the card is face-up. A player may only choose the advance action if they have enough energy points, they have no face-down route cards or they have no matching danger icons in their route. Note, a players hand size is seven, if at any point, they have more than seven cards in hand, they must immediately discard. 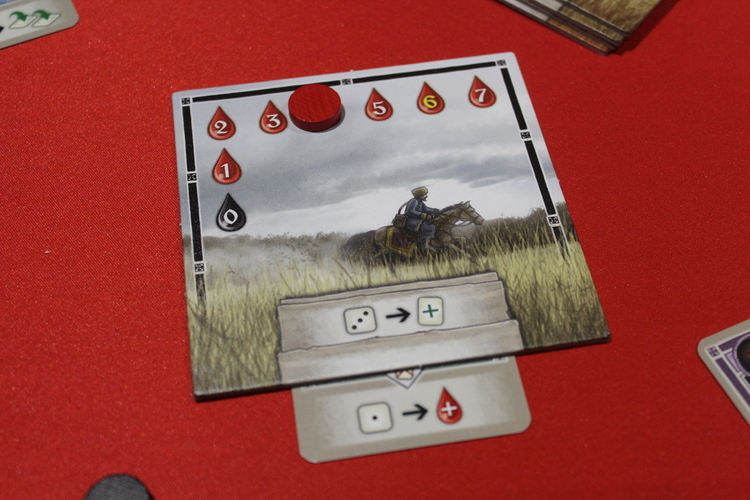 Using this action, players place resolution discs over danger icons on their route cards. Danger can be resolved in three ways, a player may resolve all the dangers that they can as one action. Discard an action card with a matching icon. This can only be used on the most recent route card ie. the one on the far right. Discard two cards with matching symbols (even if they don’t match the icon on the route card) This can be used on any route card. Subtract an energy point, again, this can be used on any route card. When a card has all it’s danger icons resolved, it is removed from the journey. Facing and resolving dangers makes you stronger though. 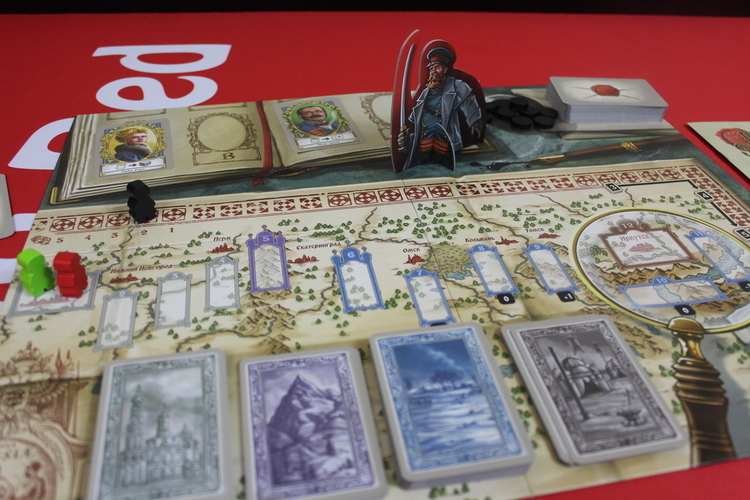 At the end of an action where a player resolved dangers and successfully removed route cards, they may choose one of the resolved cards and place it below their character board so the ability shown becomes available to them for the rest of the game. Abilities are only granted when cards are resolved using the ‘resolve danger’ action and only is allowed a turn. After all players have taken their turn, the traitor (Ivan Ogareff) has his ‘turn’. Draw a card from the action deck and carry out the actions shown at the bottom of the card. The first action will always be to move Ivan, he will move between one and three spaces along his journey. The last action will be to move the Tartars. Place the die in the indicated square and modify their strength as shown. 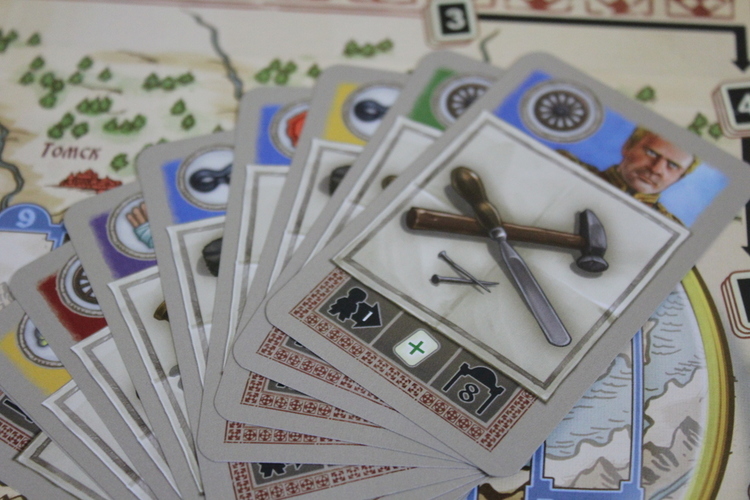 The middle icon will be one of a few things, each player draws an action card from the deck, roll the white die and all players may perform the abilities that match the result, Draw an ally card and place it in the indicated space (A, B, C or D) or the Sangarra icon. If Sangarra is already on a players journey she is returned to the board. If she is on the board, however, she will visit the player that is furthest ahead on the route. She is placed on the right of their current route cards. While she does not trigger if there are duplicate danger icons, she will prevent a player from advancing until the danger has been resolved. If Ivan Ogareff reaches the end of his journey, move his piece to square 12. Now, whenever the traitors' phase happens, no action card is drawn. Instead, roll the action dice and activate abilities as usual. Then, the Tartars advance towards Moscow as many spaces as the number shown on the die. If the Tartars enter the Capital, the invasion of Russia is successful and all the players lose the game! The Tartar troops are represented by a black die whose strength varies. If a player moves into a square they are occupying, they must roll the action die and roll higher than the Tartars strength to succeed. If they fail, they lose one energy point, if they win they are rewarded with an action card. If the Tartars enter a box that a player is in, that player is captured! They must draw a route card from the Tomsk deck. This is placed to the left of their journey and can never be resolved. If/When a player advances into square 12 of the journey, they do not draw a route card. Instead, the final battle with Ogareff begins that will finish in victory or death! First, they must get rid of all route cards including any Tomsk cards they may have. The player must eliminate each danger icon on every card by discarding an action card from their hand with the same icon. If they don’t have a matching card, they must lose one energy point. Running out of energy on this space results in immediate death (elimination from the game) though! After getting rid of all their route cards, you must now face Ivan himself! 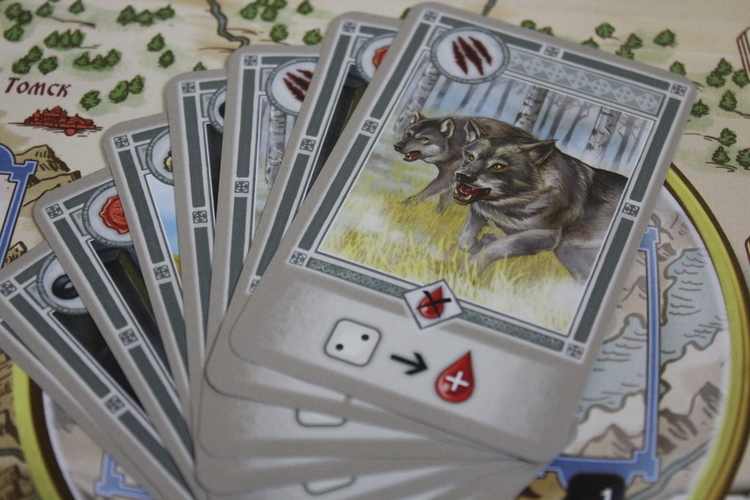 One by one draw and resolve as many Irkutsk cards as are indicated on the board in the zone that Ivan is (between three and five cards) For each card drawn, the player must discard a card from their hand with the matching symbol. For each card, you cannot discard, lose one energy. If at any point you run out of energy, you are eliminated from the game and the rest of the players can continue their journey and try and defeat Ivan themselves! There are very few games out there based on books, yet a lot on film and T.V. shows. Books provide just as rich and detailed theme and that really shines here. The rule book contains detailed descriptions for each of the ally cards along with how they fit into the story. The same is also provided for each location on the board, meaning this can be a really immersive trip into the world of Jules Verne if you wish. However, it also plays nicely without that knowledge or insight if you don't want it. The muted board colours are pleasing, not overwhelming and a great contrast to the cards and sense of danger they bring throughout the game. This is a very tricky game to beat that has a lot of components in a small size box, don't be deceived!